This is my grandfather’s pocket watch, which usually lies hidden at the back of a drawer along with other assorted things I’ve kept since I was a child. From time to time I think of it and remember where it is, and sometimes I’ll go and rummage about and find it, and hold it in my hand. I’m glad I still have this thing that was once his. I used to have others – I remember a little wooden snuff box that still smelt tantalisingly of snuff – but no amount of thinking or rummaging in drawers will bring this back. It’s gone, and exists only in my memory. I was still very young when my grandfather died and my memory of him is hazy and dim. But this watch, this small thing that he must have held often, and handled – it lies in my hand, smooth and round and surprisingly heavy, and I think of him. In another hundred years, or even in 50, what object that I use every day could find its way into another’s hand and be so full of delight? I can think of nothing at all. Well said and fits well with this week’s theme. I loved this and I am going to go find my Dad’s watch (it was his grandfather’s) and hold it for a while. Very nice choice for the challenge! 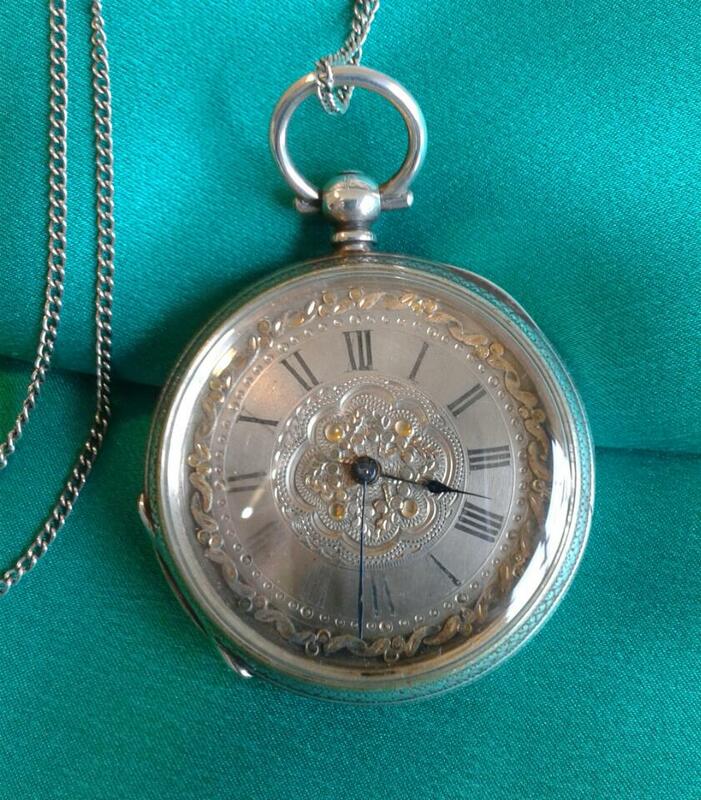 What a beautiful pocket watch. I just did a post about my grandfather’s pocket watch. They really are precious keepsakes aren’t they . ( I’m posting as ‘Through Jersey Eyes). Love this post and the meaning behind it. Now that I’m a grandmom I know how much it would mean to him to know you feel that way. When my mother died she left behind beautiful things but what everyone asked for was for one of her paintings. They were simple watercolor flowers as this was her hobby. I think of your exquisite sketches and have no doubt that your friends and family would be honored to have one. Thank you for the heartfelt post. I’m delighted to know your mother was a painter (and not surprised) and happy that she is remembered lovingly through her flower paintings. It’s true that a created thing has the essence of a person in it and is a powerful reminder of the person who created it. 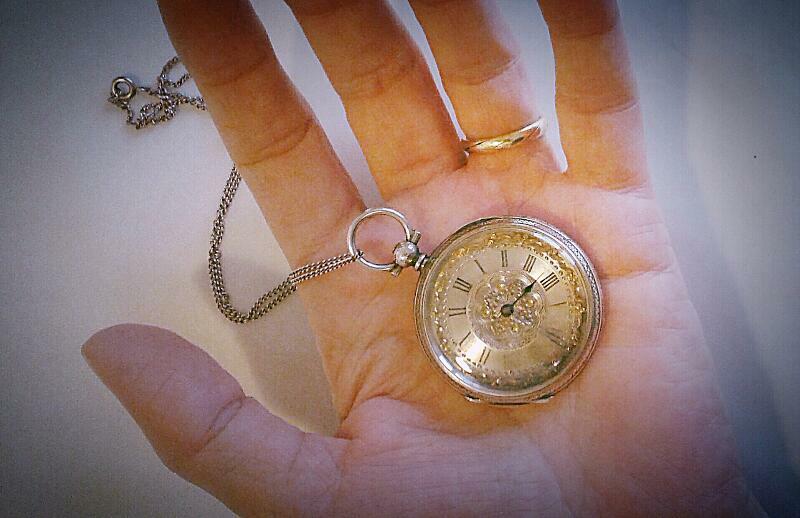 What I like about the pocket watch is that it was an object he held in his hand in the same way that I can feel it now nestling in the palm of my own, and I can’t help thinking that the objects I habitually use today don’t have the same innate qualities. A smartphone just doesn’t have that much going for it! Thanks for your lovely thoughts. Do hope you find it. Good luck searching – who knows what else you might find? !